ostumes, the whole scene, already monochromatic under a grey sky, like something from an old black and white newsreel. A small absurdist moment, shown now only to elicit laughter. Imagine thinking such bizarre practices could actually assist anyone learning to surf! 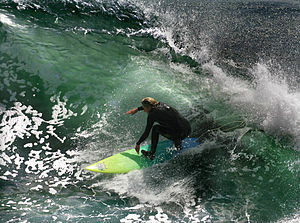 Their stark rigidity so profoundly contrasting the essential fluidity of surfing itself. Their conformity mocking the central conceit of the individuality of our styles.